Impractical Jokers TV show, season five; image courtesy of truTV. Yuk it up. Season 5B of the Impractical Jokers TV show premieres on truTV, Thursday, July 14, 2016 at 10:00pm ET/PT. The mid-season premiere kicks off the second half of the series’ fifth season with an additional 13 all-new episodes. Get the details from this truTV press release. truTV’s hit series Impractical Jokers is heading across the pond for the first time ever, with a special hour-long episode that drops the four long-time friends in London for Impractical Jokers: British Invasion. Premiering Thursday, July 14 at 10:00 p.m. ET/PT, this mid-season premiere kicks off the second half of the popular series’ fifth season with an additional 13 all-new episodes. In Impractical Jokers: British Invasion, Joe, Q, Sal and Murr cross the pond and double-cross each other, serving up pints of awkwardness and sticking out like sore thumbs. Their hilarious excursion culminates with an unforgettable punishment in front of thousands of cheering fans. The group debuted the first sneak peek from Impractical Jokers: British Invasion at a 92Y talk last night in New York, click here to check it out. A special animated promo for the special can be seen here. Monday, July 11: Live Event Invasions – high-profile punishments include appearances from the New Jersey Devils and Imagine Dragons. Tuesday, July 12: High Risk Invasions – the Jokers take on unruly crowds. Wednesday, July 13: Personal Invasions – the Jokers invade each other’s personal spaces. Thursday, July 14: City Invasions – the Jokers take their hijinx on the road with episodes shot in Miami, New Orleans, Las Vegas and Texas. Following Impractical Jokers: British Invasion is the series premiere of Impractical Jokers: Inside Jokes at 11:00pm ET/PT which packs classic, fan-favorite episodes of the show with sharable pop-up facts throughout. With behind-the-scenes stories and surprising factoids directly from the Jokers, this alternate version of existing content will give viewers a unique and unprecedented look behind the curtain. Impractical Jokers TV show season five; image courtesy of truTV. What do you think? 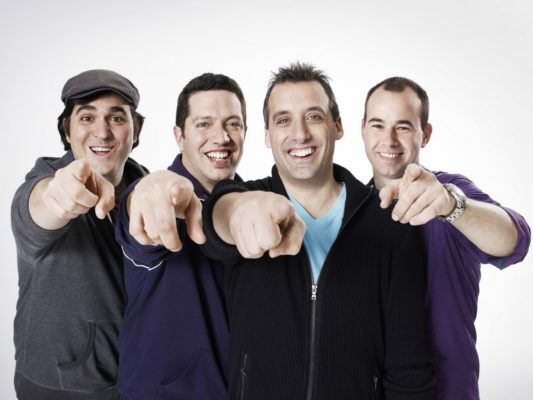 Are you a fan of the Impractical Jokers TV series? Do you plan to watch the season 5B premiere, on truTV?